Parties are a lot more enjoyable when others pitch in to help. If you're planning a party, let the professionals at Emily's lend a hand. We offer a wide variety of delicious options that not only will cut your work load but also will impress your guests. 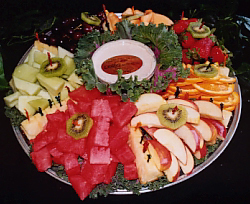 Combination Fruit & Cheese trays also are available at the same prices as above. 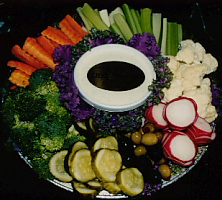 RELISH TRAYS CONSIST of a combination of carrots, celery, cauliflower, broccoli, radishes, green and black olives and dill pickles. This tray includes our choice of dill, ranch or parmesan peppercorn dip. 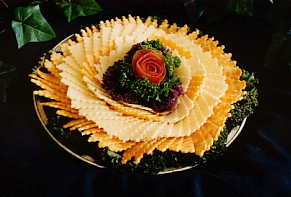 ALL-CHEESE TRAYS contain an assortment of cheeses beautifully displayed to serve with crackers. Also works well as an accompaniment to platters of shaved meats and dinner rolls for sandwiches. Cheeses include co-jack, cheddar, monterey jack, havarti, hot pepper and muenster. 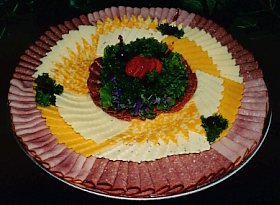 COLDCUT AND cheese trays are arrangements of summer sausage, smoked ham and hard salami with a variety of cheeses. Great for hors d'oeuvres! Best served with crackers or dinner rolls. 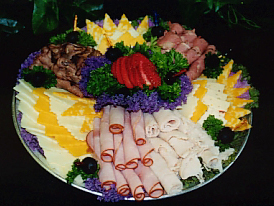 OUR DELI MEAT and cheese tray is a beautiful tray made with turkey breast, roast beef, corned beef and smoked ham, plus a variety of cheeses. Pick up some cottage buns or silver dollar buns to complete the meal. OUR SHAVED meat trays can be made to fit your needs for those larger parties. Just order any of our delicious meats by the pound and we create a tray that is easy to serve. 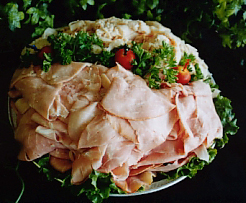 Our most popular meats are shaved turkey breast and old tyme ham. Other meats include roast beef and corned beef. Best served with our cottage or silver dollar rolls. Order an all-cheese tray on the side to complete your meal. IMPRESS YOUR guests with a giant submarine sandwich created on Emily's fresh-baked french bread. Our sub includes summer sausage, ham, turkey breast, cheddar and swiss cheese with lettuce, tomato and onions. We send our creamy garlic dressing on the side. 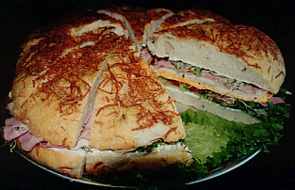 WITH OUR City Hall sandwiches, we do all the work for you! We start out with white, wheat or pumpernickel cottage rolls and add butter and lettuce. We can do a variety of meats, or you can choose specific kinds. Your choices are: turkey breast, ham, summer sausage, hard salami, egg, chicken or tuna salad. 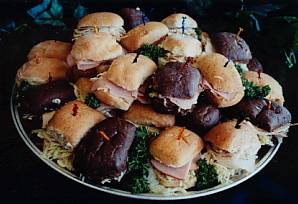 These sandwiches are arranged and garnished on trays. $12.95 per dozen, with a 2-dozen minimum. corned beef . . . . $14.50 per dozen. "A TASTY SANDWICH begins with a great bread." This message is particularly true when referring to our Foccacia sandwich wedges. We begin with our made-from-scratch Foccacia flatbread and then add a variety of fixings -- you let us know what your favorites are. Our most popular combination is turkey breast, old tyme ham and co-jack cheese with leaf lettuce, sprouts, cream cheese and creamy garlic dressing. LOOKING FOR something different? Try our salmon spread. 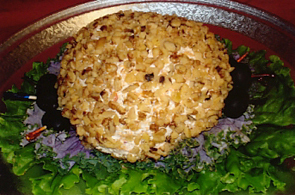 This is a tempting treat made with smoked red salmon, cream cheese and seasonings. Add crackers to the tray and use it as a center piece for the table. A real treat when served with our European baguette bread! Available in the shape of a ball or log. OUR CHEESE SPREAD is made with cream cheese, cheddar cheese and seasonings. 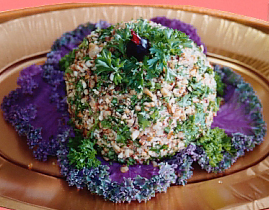 Serve it with crackers for a wonderful hors d'oeuvre. Available in the shape of a ball or log. NEED DESSERT? Save yourself time and let Emily's professional bakers do the work! 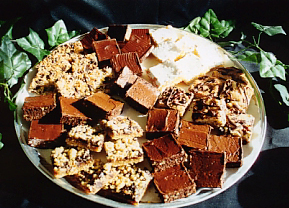 Our dessert tray includes an assortment of Emily's bars and/or gourmet cookies on a tray. $11.95 per dozen with a 2-dozen minimum.